The Keeling Curve - The measured concentration of CO2 in the atmosphere Measurements made at Mauna Loa, Hawaii. 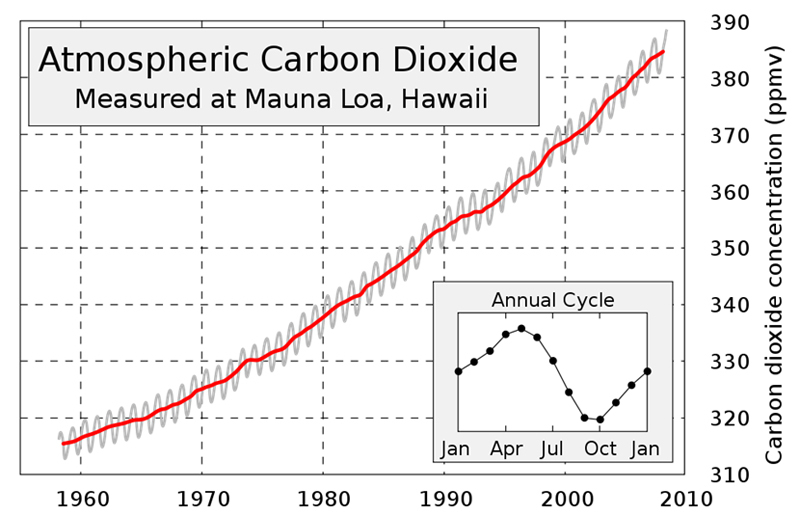 Source of data: CDIAC/SIO Source of graph: Wikipedia - "Own work, from Image:Mauna Loa Carbon Dioxide.png, uploaded in Commons by Nils Simon under licence GFDL & CC-NC-SA ; itself created by Robert A. Rohde from NOAA published data and is incorporated into the Global Warming Art project". © 2010 Earthguide at Scripps Institution of Oceanography.